Wooden pallets and pieces of wood remains are everywhere nowadays. Chances are, you have one lying around your garage right now. These pallets, along with most bits and pieces of wood remains are often ignored and left to rot by many but you can use them for various projects that can be helpful, decorative and cost-saving for you. 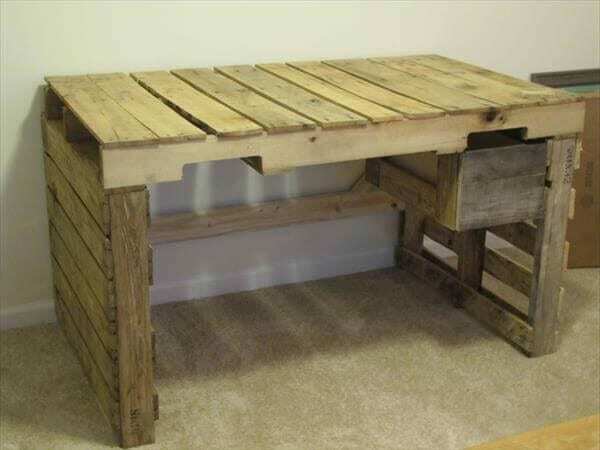 One of the recycling projects you can use your wooden pallets for is furniture making. One of the most expensive pieces of furniture you’ll ever buy from the furniture store would be a desk. Wooden desk price normally ranges from around six hundred to a thousand dollars, even more for the fancy looking ones. But why break the bank when you can build your own DIY pallet desk with these 10 easy Pallet Desk DIY plans. Check out the list below. 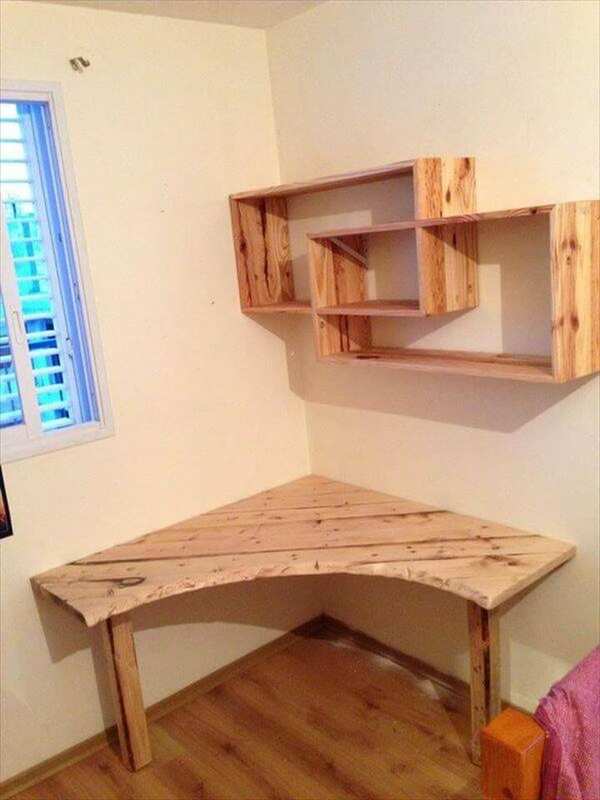 Who doesn’t want an awesome wooden desk for their workshop? This wooden pallet desk for your workshop is a must. I for one, have my own wooden pallet desk in my workshop. 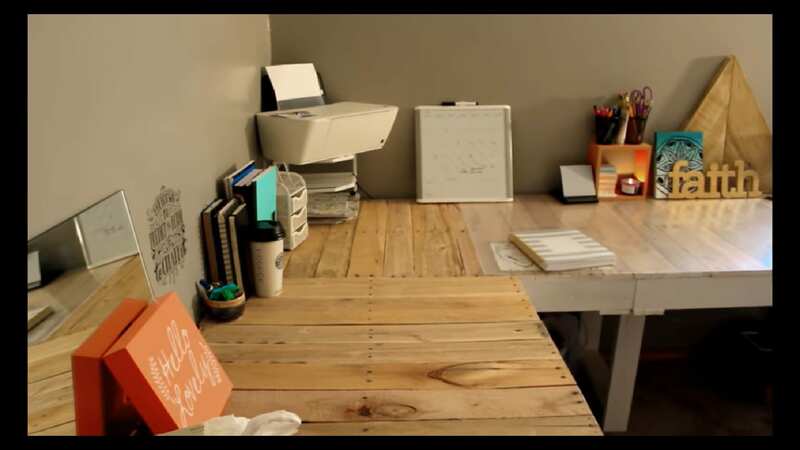 This amazing space efficient pallet desk by Fringe Focus blogger Robert Loukotka is an easy wooden pallet desk DIY of just 13 steps. You cannot resist having one for your workspace. 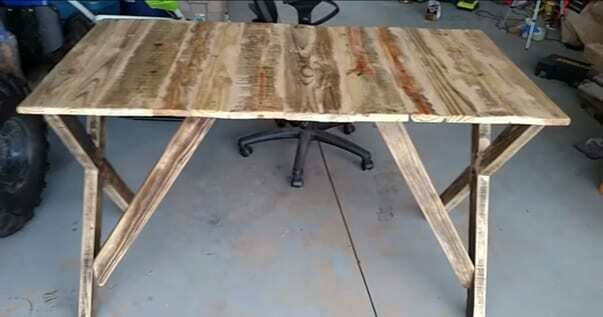 Building this DIY pallet desk is no easy task for non-woodworkers, but it is not impossible. This 13-step tutorial is easy to follow and requires very little experience. It only includes gluing together the wood pieces, minimal cutting and sanding the final table surface. 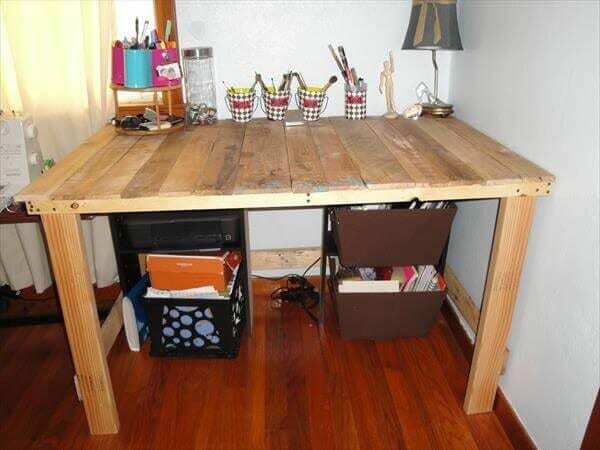 If you’re needing a nice big desk to organize all your workshop items but you don’t want to spend too much on expensive desks then this pallet DIY is perfect for you. Making an art out of wood can be a hectic task and requires good art skills. But this much easier way of creating an artsy piece of wooden furniture is a must DIY for anyone. This sectional pallet enhances the character of this pallet desk and features space-saving. You will only need some tools and finishing wood products to follow this DIY pallet desk plan by ETZNOY on Facebook. DIY pallet table plan on a budget! This is another pallet desk DIY project that requires a good amount of time and a certain level of woodworking skills. This item is built on a wooden pallet but also includes some wooden parts that have to be connected by a hinge. The first part (the wooden pallet) doesn’t have to be designed but the foldable wood is shaped in a specific design and all parts were attached together to make the final wooden desk. When I was searching the internet for cool wooden desks I found this one above and really liked it. 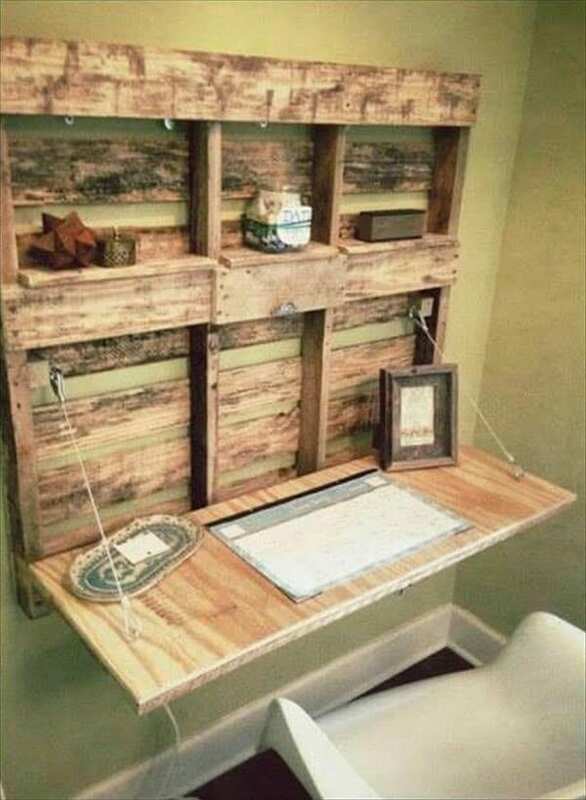 The great thing is, 99 Pallet Ideas have a lot more DIY desk pallet ideas that are easy to do with little woodworking skills. This Pallet desk is more than just stylish and cost-effective, it is also efficient and convertible. This folding pallet desk is perfect for those who want a compact desk. This wide underside pallet desk table has enough room for boxes underneath. I personally like how practical it is! This may be the easiest DIY plan in our list today. 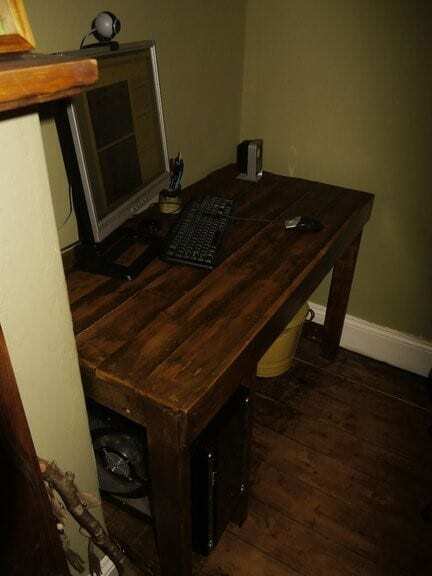 This DIY pallet desk from 99 Pallet Idea was tactically refurbished wooden pallet. Its top is the pallet itself with its spaces enclosed with more wood strips. Its table legs are regular wood cut into measurements. As soon as I found this tutorial I found that it is one of the easiest to do. Some of the items needed for this project are a crowbar for dismantling the pallet wood strips, a saw to cut wood, nails and hammer, sanding equipment and measurements. I realized just how wonderful it is to reuse a wooden pallet and built this beautiful and useful desk, so I am hopeful that you try it out too! I have been a longtime fan and enthusiast of minimalism. This DIY pallet desk by instructibles is an impressive easy and fast how-to that allows you to transform the most of a large pallet into a sizable and compact pallet desk. Finishes with varnish and wood finishing, this piece is seriously gorgeous and according to the article, did not even cost more than five pounds. So, if you are old school and looking to use desktop PCs in your room but aim to conserve as much space, then this minimalistic pallet desk is just perfect for you. 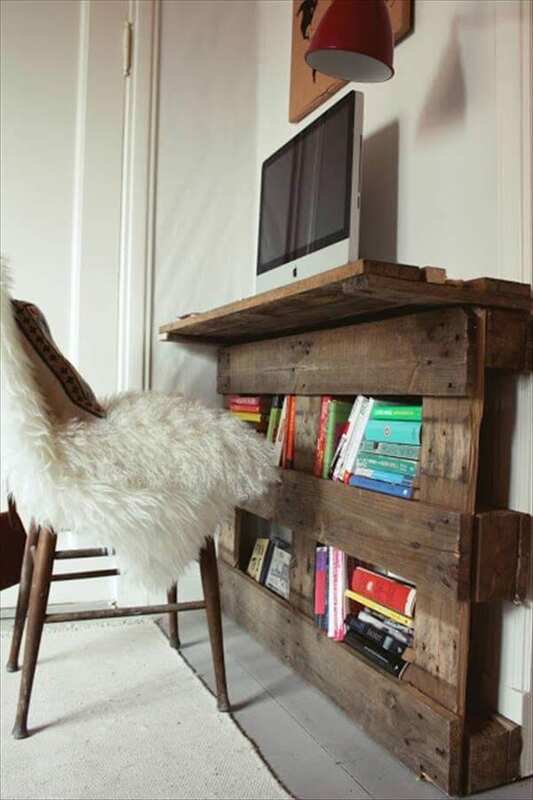 Rustic but practical, it looks great for minimal cost and minimal materials. If you don’t have this, then this is one of those things you never think you need until you get it. 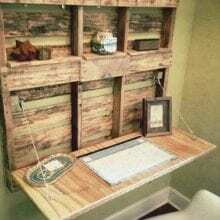 This L-desk is one hundred percent recycled from wooden pallets. This can give the room a nice look and you’ll get more space because of its shape. You don’t have to worry, this L-shape desk does look very sophisticated, but it is easy to do and requires minimal woodworking skills. This wooden pallet desk by youtuber Chris does what was made for his wife when she was looking for a cheap desk and instead tried to do it themselves. It turned out well. 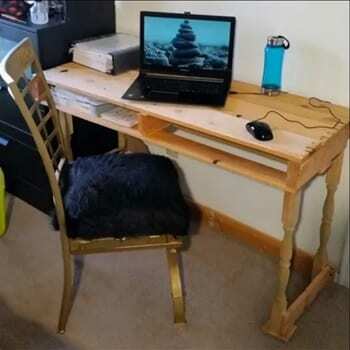 This fully functional and sturdy DIY pallet desk can hold a lot of weight and can be trusted for most items in your house. You will definitely be more comfortable using this $5 table than a thousand-dollar expensive one that functions in the exact same way. Luckily, if you’re feeling a bit more luxurious than just $5, this video tutorial by Frugality DIY also teaches beginners with little to almost no-experience in woodworking how to make a DIY pallet desk. The process of this pallet desk is the same as the $5 one, but the video offers a more in-depth, step-by-step tutorial for this DIY. Moreover, the finished product looks more elegant than the $5 one. So, it’s worth the extra 10 bucks. Make sure to check out the tutorial video. 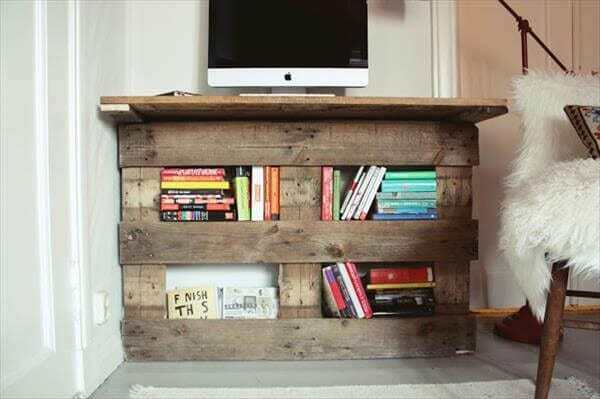 This unimaginably easy DIY wooden pallet desk doubles as a bookshelf. This is my personal favorite in all this list. You can place it in a corner and not worry about the space it will take. This pallet desk can be upgraded with colors. This Do-it-yourself pallet desk plan by 99 pallet ideas is an innovative use for a simple pallet frame. This easy to do furniture does not even involve too much woodworking skills or steps. The frame of the pallet is kept as it is and is only remodeled to have larger spaces in between and a top. Even looking at other angles I can say that this escritoire is seriously stylish for a DIY wooden pallet desk. Making this a statement furniture of a compact furniture is a must! The last on our list is also a gorgeous piece with one more feature added to it. This DIY wooden pallet desk is made from several wooden pallets and some pieces of wood and comes with a single drawer. Although this requires a little more experience with woodworking, anyone can try this tutorial from 99 Palette Ideas. 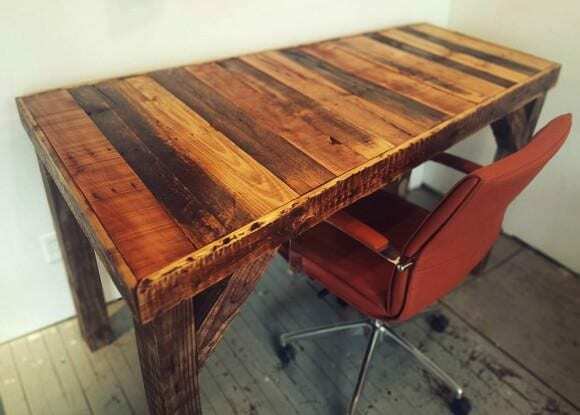 Whether you’re looking to recycle that wooden palette sitting in your garage for the longest of time or you’re wanting a new desk, or you’re itching for your next DIY project, these ten wooden pallet desks are ideal for you! All these plans are easy to follow and easy to recreate. With less than intermediate skills in woodworking, minimal tools and even less money required, you can follow through these DIY ideas and plans. You can choose whether to create a wide table with a lot of leg room and box room or save some space with the compact and foldable pallet desk. These DIY plans are seriously stylish for your house or workspace! Did you enjoy this list? If you did, make sure to tell me in the comments and don’t forget to share this article with your fellow DIY-ers.